Choosing the right eye makeup for grey eyes can really enhance your eyes, whether they are a rich shade of inky grey or a light grey-blue. Like all eye colors, there is no singular grey that encompasses all hues. Just like their green, blue, and brown-eyed sisters, there is a wide range of shades in grey eye colors. While grey-blue eyes are one of the more common grey eye colors, there are also pale greys, green-greys, dark greys, and hazel-greys. Although grey eye colors are not as prevalent as brown and blue, there are certainly many eye makeup shades that can work wonderfully. There are essentially two ways to choose makeup for grey eye colors. The first way is to determine what other shades exist along with grey. Carefully examine your iris in good lighting wearing a white shirt. Do you see hints of blue in your eyes? Or are they more of a taupe shade that has hints of brown or hazel? Are they more violet or more green? Many grey eyes lean towards another hue, and you can choose the best eye makeup by selecting shades designed for blue, green, or brown eyes. Another way to choose makeup for grey eyes is by simply treating grey as a neutral. Neutral colors work well with nearly any other color, but choosing eye makeup colors will depend largely on your skin tone and hair color. If you have warm undertones, opt for richer, warmer colors. If your skin has cool undertones, icy or bright colors will serve you better. The makeup you choose will also depend largely on the look you are trying to achieve. Since orange is the color opposite blue on the color wheel, it is a great eye shadow color for blue and blue-grey eyes to really play up the blue. This doesn't mean needing to wear bright orange shades, though. Subtle peaches, rich bronzes, and coppery shades can all help bring out the blue color in grey eyes. Although the contrast color for green is red, this color doesn't always work well for grey eyes and can make them look irritated. Instead, green-greys can choose from tertiary colors in the orange color family, such as salmon or almond, or the purple color family, such as orchid, lilac, or plum. If your grey eyes have a hazel, tan, or brown undertone, turn to shadows for brown eyes. Purple shades, for example, will complement your eye color well. Brown shades like chocolate, mocha, and tan will also look wonderful with this eye color. Grey eye makeup can work for grey eyes in two different ways. Applying a lighter shade of grey eye shadow or eyeliner will make the grey color of your eyes appear darker. Conversely, applying a darker grey shade will make your color appear lighter. You can also apply several different shades of grey eye shadow. Apply a medium grey shade (at least one or two shades different than your eye color) as your base, use a dark grey for your contour color, and a light grey for your highlight shade. This method of using nearly monochromatic color creates a sophisticated and elegant look that draws subtle attention to the eyes. 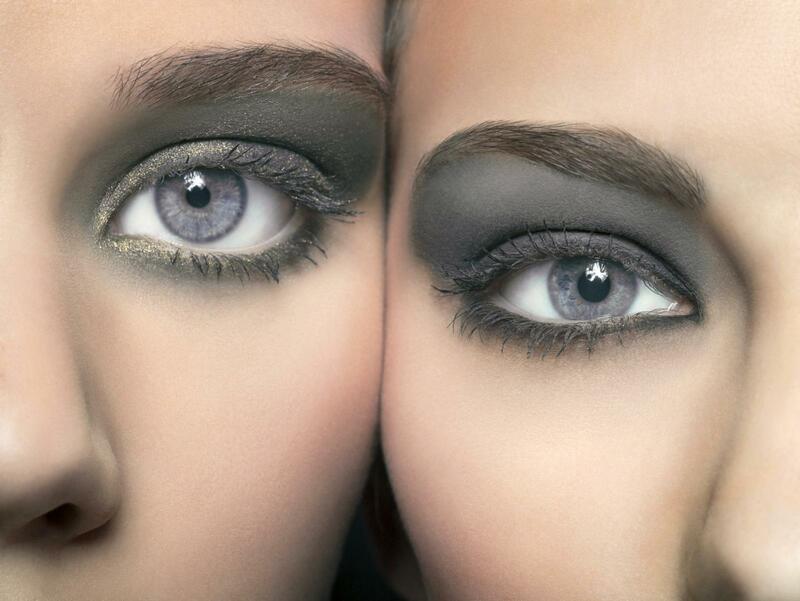 Black and silver eye makeup colors are another great choice for grey eyes. 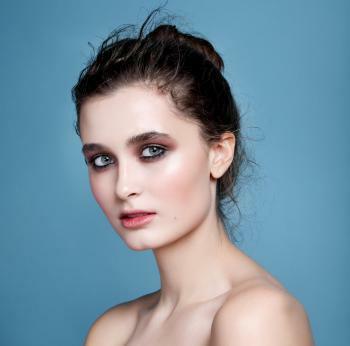 A black smoky eye can really make the eyes stand out, especially if you have pale grey eyes. 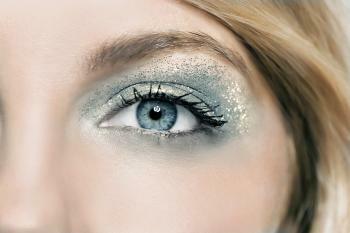 Use silver shadows as a highlight to add a touch of extra sparkle, or try metallic silver eyeliner for a creative party look. Pale pink, light teal, or shimmery purple could be combined with the silver liner for a spectacular effect. Although there are many colors grey-eyed women can wear beautifully, there are some to avoid. Some shades of pink and red (particularly bright, bold shades) can make the eyes look teary or inflamed, so be careful using these colors. Another eye makeup color to avoid is a grey that matches or is extremely close to your eye color. This won't bring out the natural beauty of your eyes the way many other colors can.